This morning I woke up and remembered that I'd had a dream about someone I went to high school with. Occasionally I'll drop this person an email just to catch up with him. I searched the Intertubes using the Google(tm) search engine to see if the email I had for him was current, and discovered that he was on Facebook. So, I took a look at his profile. I noticed that he had a bunch of folks from high school "friended". It was weird seeing a lot of these people that I haven't seen or spoken to in 15 years. Brought back a lot of memories. And it was cool....I could view one person's set of friends, look at one of their friends, and then look at their friends....you get the picture. It's a giant web so that eventually, I'm sure, I'd find everyone I graduated with. Or at least the ones that I graduated with. So I asked to be friended to several folks....join a couple of groups. And I've since gotten friend requests from several other folks. Oddly enough, this seems really cool to me. Surprisingly, I've got a facebook account, myspace account, and several other social network accounts, but most of them lie dormant. I never actually thought to use facebook to find folks I went to school with. It just never occurred to me. I guess because I graduated with a group of people that didn't grow up with the internet -- it was just catching on as we were all in college. Which, I guess, would be a good reason they would be on facebook. I'm not quite sure why I'm so late to the game. My job is basically the internet. I'm pretty good at keeping up with technology. But for some reason, I never took the time to "groom" my social web sites. Maybe because it's too time consuming. I use twitter quite a bit, but basically that's nothing more than sending a message from my phone, along the lines of "sitting in Macy's, picking my nose while Wife tries on clothes". No grooming necessary. I'm a huge fan of instant messaging. Maybe I prefer these social interactions (can they really be called that?) because they're instant. Whatever the reason, I'm sucked in now. I'll probably addictively check my facebook account, hoping that I'm friended by someone else I went to school with. Today I got to chat with two people I haven't spoken with in a long time. It was nice to catch up with them. I hope I can do it some more. It's the political silly season, and the other day I was driving behind a car. On the back of the car there was a bumper sticker "Got Hope?". My reply? Yes, yes I do! Now, those who know me know I'm a political junkie. I've been reading the political blogs and eating up everything I can about this election. I'm a strong believer in our system and enjoy the privilege of partaking in it. While there are days that I come home ranting and raving about what's going on and the idiocy that does go on in our government, in the end this is an enjoyable time for me. But I need to make something clear...hopefully those who know me best know that before I affiliate myself with a political ideology or party, I identify my self with a Person -- Jesus Christ. Above all else, that is where my identity lies. And so yes, I do have Hope. 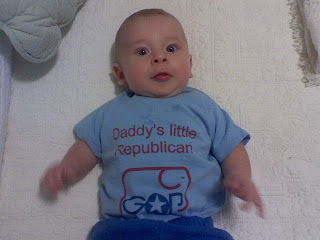 I had Hope before the 2008 election began (it seems like so long ago). I had Hope before it became a popular mantra invoked by a presidential candidate. I had Hope starting in 1989 when I professed my faith in Christ. You see, my Hope doesn't lie in Barack Obama or John McCain....my Hope lies in Christ and Christ alone. Hope and Change! Because as I'm walking with my Lord, He's changing me each day to be more like Him! Presidential candidates and presidents themselves make promises they can't keep...they pander to people to get their vote and give them what they want to hear. Christ, on the other hand, doesn't make promises He can't keep. He's faithful to His Word. He told us that He's the only way to God the Father. He's true to His Word and promises us we can have Life and Life more abundantly by following Him. Don't get me wrong....I have a guy I'm rooting for in this race, and I pray he wins. But if he doesn't, I know that God is sovereign and He'll still be in control over all. Paul reminds us in Romans 13:1 "Everyone must submit to governing authorities. For all authority comes from God, and those in positions of authority have been placed there by God." So, if my guy loses, <shrug>. God's in control and it's all according to His Will. And, in reading Jeremiah, I'm reminded that the Judeans were exiled to Babylon, but God promised to take care of them and to bring them home. There's no one here that can provide the Hope and Change I truly need. The One who can left this earth 2000 years ago. And, unlike anyone here, He's King for eternity. That's my Hope!